Nine years between sequels can be a long time – especially when you are using a few of the original actors, but it seem to have turned out ok in this case. Taking place about seven years after the original Phantasm movie, we start out with Mike, the young hero from the original film being released from an insane asylum. While he was in, he somehow became mentally linked with a girl “of his dreams that knows about the antagonist, “The Tall Man.” Mike, once released, goes directly to this town’s grave years and unearths several caskets to prove to himself (and now protector, Reggie – also from the original film), that he did not imagine all the events of the first film. 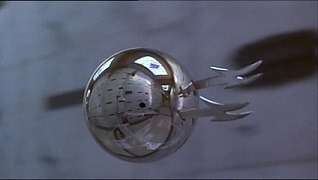 What happened in the first film, you may ask? Well, you should go see it, but here’s a quick run down for you: a kid (Mike) discovers that the bodies at a local graveyard/mortuary/mausoleum are being converted into shortened, reanimated evil Zombies (to be used as slaves on a nasty alien planet), and Mike, his older brother and Reggie (his older brother’s best friend) mus t fight them and the Tall Man that controls them. travelling from town to town in an effort to hunt him down and (hopefully) destroy him once and for all. Along the way they pick up a female hitchhiker and run into the girl of Mikes dream, providing love interests for both of our main protagonists. The battle is soon on and the real action commences. 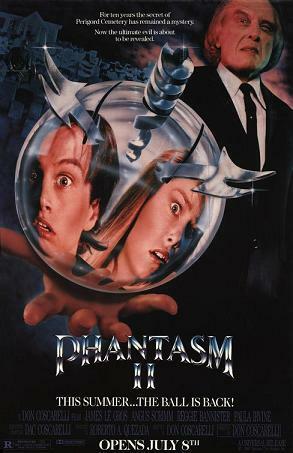 While I liked the original Phantasm film, I think this is a better film, as the original actor that played Mike has been replaced – a good thing, as I thought the portrayal of character mike was the worse thing in the original film. If you liked the first film than you should really see this. This entry was posted on June 3, 2012 by catfishman. It was filed under Uncategorized and was tagged with 1988, aliens, ball, cheezy, entertainment, horror, killer, midget zombies, movie, orb, Phantasm, Reggie Watson, sci-fi, science fiction, sequel, The Ball is Back, zombies.